In Christianity, All Souls' Day or the Commemoration of All the Faithful Departed, that is, of the souls of all Christians who have died, follows All Saints' Day. Observing Christians typically remember deceased relatives on the day. In Western Christianity the annual celebration is now held on 1 November and is associated with the season of Allhallowtide, including All Saints' Day and its vigil, Halloween. 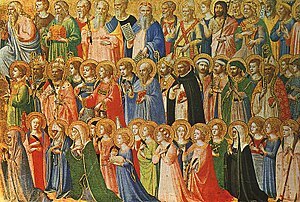 In the Catholic Church, "the faithful" refers specifically to baptized Catholics; "all souls" commemorates the church penitent of souls in Purgatory, whereas "all saints" commemorates the church triumphant of saints in Heaven. In the liturgical books of the western Catholic Church it is called the Commemoration of All the Faithful Departed, and is celebrated annually on 2 November. In the ordinary form of the Roman Rite, as well as in the Personal Ordinariates established by Benedict XVI for former Anglicans, it remains on 2 November if this date falls on a Sunday; in the 1962−1969 form of the Roman Rite, use of which is still authorized, it is transferred to Monday, 3 November. On this day in particular, Catholics pray for the dead. In the Church of England it is called The Commemoration of the Faithful Departed and is an optional celebration; Anglicans view All Souls' Day as an extension of the observance of All Saints' Day and it serves to "remember those who have died", in connection with the theological doctrines of the resurrection of the body and the Communion of Saints. In the Eastern Orthodox Church and the associated Eastern Catholic Churches, it is celebrated several times during the year and is not associated with the month of November. Allhallowtide, Hallowtide, Allsaintstide, or the Hallowmas season, is the triduum encompassing the Western Christian observances of All Saints' Eve (Halloween), All Saints' Day and All Souls' Day, which last from 31 October to 2 November annually. Allhallowtide is a "time to remember the dead, including martyrs, saints, and all faithful departed Christians." The present date of Hallowmas and thus also of its vigil (Hallowe'en) was established for Rome perhaps by Pope Gregory III (731–741) and was made of obligation throughout the Frankish Empire by Louis the Pious in 835. Elsewhere, other dates were observed even later, with the date in Ireland being 20 April. In the early 11th century, the modern date of All Souls' Day was popularized, after Abbot Odilo established it as a day for the monks of Cluny and associated monasteries to pray for the dead. Easter Triduum , Holy Triduum, or Paschal Triduum, or The Three Days, is the period of three days that begins with the liturgy on the evening of Maundy Thursday, reaches its high point in the Easter Vigil, and closes with evening prayer on Easter Sunday. It recalls the passion, death, burial, and resurrection of Jesus, as portrayed in the canonical Gospels. Eastertide or Paschaltide is a festal season in the liturgical year of Christianity that focuses on celebrating the Resurrection of Jesus Christ. It begins on Easter Sunday, which initiates Easter Week in Western Christianity, and Bright Week in Eastern Christianity. There are several Eastertide customs across the Christian world, including sunrise services, exclaiming the Paschal greeting, clipping the church, and decorating Easter eggs, a symbol of the empty tomb. The Easter lily, a symbol of the resurrection, traditionally decorates the chancel area of churches throughout Eastertide. Other Eastertide customs include egg hunting, eating special Easter foods and watching Easter parades. 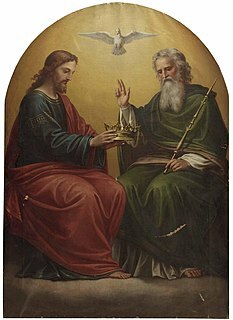 Candlemas, also known as the Feast of the Presentation of Our Lord Jesus and the Feast of the Purification of the Blessed Virgin Mary, is a Christian Holy Day commemorating the presentation of Jesus at the Temple. It is based upon the account of the presentation of Jesus in Luke 2:22–40. In accordance with Leviticus 12: a woman was to be presented for purification by sacrifice 33 days after a boy's circumcision. It falls on February 2, which is traditionally the 40th day of the Christmas–Epiphany season. While it is customary for Christians in some countries to remove their Christmas decorations on Twelfth Night, those in other Christian countries historically remove them on Candlemas. On Candlemas, many Christians also bring their candles to their local church, where they are blessed and then used for the rest of the year; for Christians, these blessed candles serve as a symbol of Jesus Christ, who referred to himself as the Light of the World. Radonitsa, also spelled Radunitsa, Radonica, or Radunica, in the Russian Orthodox Church is a commemoration of the departed observed on the second Tuesday of Pascha (Easter) or, in some places, on the second Monday of Pascha. A memorial service is a liturgical solemn service for the repose of the departed in the Eastern Orthodox Church and those Eastern Catholic Churches, which follow the Byzantine Rite.